Photo Collage Maker lets you print your photo albums, scrapbooks, postcards, invitations, posters and other creations in professional quality. The built-in Page Editor offers you to choose from the most common paper types or add your own. 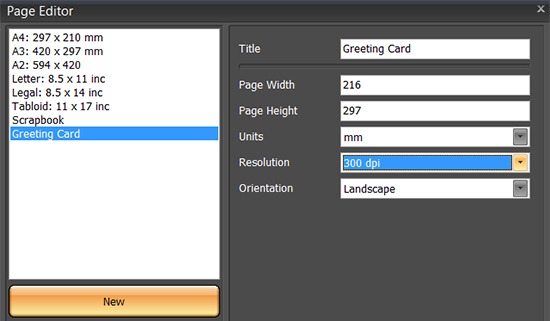 You can specify the page dimensions, orientation, and print resolution (up to 600 dpi for best quality). 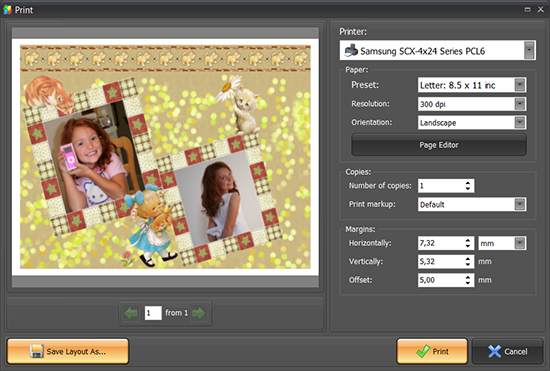 The smart print module will create the best layout for the selected paper size. You can adjust the margins and add markers for convenient trimming. If you prefer to use a professional printing service, save the print layout as JPEG, PDF, PNG or TIFF. You can then send the file by email or put it on a USB stick and take it to your local print shop. I was planning to make a family photo book and surfing the Web for ideas when I stumbled upon this collage software. The demo looked good - absolutely easy and intuitive, even for a non-tech savvy gal like me! So I ordered the full version, and the new templates that came with it were just gorgeous. Great source for hundreds of photo books in fact! This app was a great help when we were working on our flower business website. Stylish collages with elegant borders, awesome masks of different shapes, rich text options - these are just some of the key points that helped us create stunning images. Now we're using Photo Collage Maker for making promotional leaflets, and the prints are perfect quality! for collage creation and digital scrapbooking!